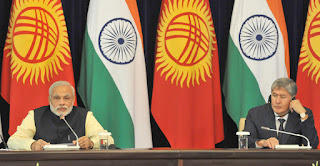 The Prime Minister, Shri Narendra Modi delivering his statement to the media at Joint Press Briefing with the President of Kyrgyz Republic, Mr. Almazbek Atambayev, at Ala-Archa State Residence, in Bishkek, Kyrgyzstan on July 12, 2015. It is a great pleasure to visit this beautiful country. I am deeply touched by the warmth and the hospitality. Close ties over centuries creates a special kind of closeness and goodwill that adds a lot of charm and interest to the visit. 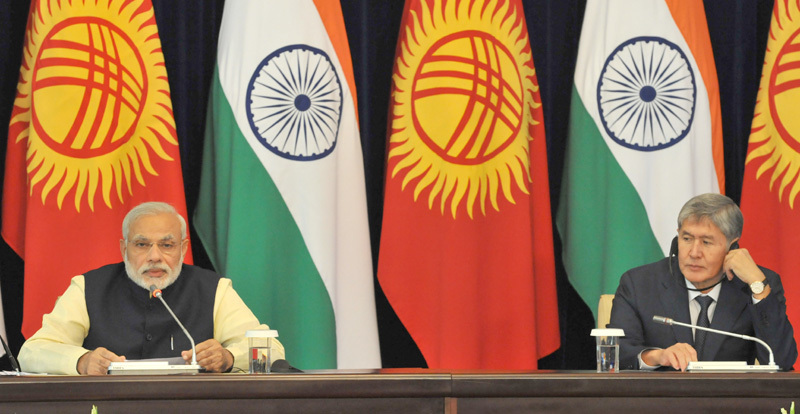 Kyrgystan and India are also united by the bonds of shared democratic values. We see an important place for Central Asia in India's future. We can reinforce each other's economic progress. Sustainable development is important for both. We can contribute to cooperation and integration across the different regions of Asia. We both seek a peaceful and secure neigbourhood at a time of challenges in our region. And, we have shared interest in combating extremism and terrorism that has become a threat without borders. My visit to all five countries in the region demonstrates the importance that we attach to a new level of relationship with Central Asia. Kyrgystan is a key part of that vision. I was pleased to meet President Atambaev. His contribution to democracy and development is admirable. I am delighted that our Election Commissions have signed an agreement on cooperation. We also look forward to the visit of a Kyrgyz Parliamentary delegation to India after the parliamentary elections in the Kyrgyz Republic. I had very enriching discussion with President Atambaev. I deeply appreciate his commitment to the relationship. We spoke at length about strengthening our relations in trade, investment, tourism, culture and human resource development. I welcome the agreements on Standards and on Culture today. Collective initiative between India and Central Asia will boost our economic ties. I look forward to the launch of the tele-medicine link with India. It is the first in the region. And, it tells us about the possibilities of the digital world. We will also initiate the second Phase of the Kyrgyz-India Mountain Bio-Medical Research Center. We will enhance our engagement in capacity building and increase the training offers for Kyrgystan to 100 this year. I am pleased that we have established a India-Kyrgyz Centre for Information Technology in the Kyrgyz State University in Bishkek. Information technology is critical for success today and for creating opportunities for the youth. We will be pleased to set up similar Centres in other major cities in Kyrgystan. Agriculture is an important sector in both India and the Kyrgyz Republic. We will shortly hold a round table in Bishkek to explore possible avenues for cooperation and identify concrete projects in the agriculture sector. Later today, I will have the privilege of unveiling the statue of Mahatma Gandhi on the street that bears his name. I thank the people of Kyrgystan for this honour. His life and message are universal and timeless. This statue will also remind the residents of our shared values. Kyrgystan's commitment to the United Nations Peacekeeping Missions is truly laudable. And, it is a great pleasure for India to support this effort on the strength of its long experience in this area. I will have the pleasure of handing over a small contribution of field medical equipment to Kyrgyz Armed Forces. Our defence ties are strong. We have just completed a joint exercise Khanjar 2015. We have decided to hold joint military exercises on an annual basis. The IT Centre in the Kyrgyz Military Academy is an example of innovative cooperation that is important to both countries. Our new agreement on defence cooperation would provide a framework to broaden our engagement. This will include the defence technology. I congratulated President Atambaev on Kyrgyzstan joining the Eurasian Economic Union. We agreed that a Free Trade Agreement between India and EEU will substantially increase our cooperation .He expressed support for an early completion of the Joint Study Group’s Feasibility Report. We agree that this will make Kyrgyzstan a base for India’s economic engagement in the region. We also looked forward to our engagement in the Shanghai Cooperation Organisation. I am grateful for Kyrgystan’s strong support to India’s candidature for permanent membership of an expanded United Nations Security Council. I sought his support for early completion of the reforms of the United Nations and its Security Council. Finally, I thank President Atambaev and Kyrgystan for the support in the International Day of Yoga on June 21 a huge global success. I look forward to my meetings with Speaker Jeenbekov and Prime Minister Sariyev later today. I am confident that the visit will take our bilateral cooperation to new heights. I look forward to an early opportunity to receive President Atembaev in India. The Prime Minster, Shri Narendra Modi has congratulated tennis players Sania Mirza and Martina Hingis, on winning Wimbledon women's doubles title. "Well played Martina Hingis and Sania Mirza. You played wonderful tennis and registered a fantastic win at Wimbledon. We are proud and very happy", the Prime Minister said. Air Chief Marshal Arup Raha, Chairman Chiefs of Staff Committee and Chief of the Air Staff has proceeded on a four day visit to South Africa. The IAF Chief is visiting South Africa on the invitation of Lieutenant General FZ Msimang, Chief of Air Force, South African Air Force. During the visit, Air Chief Marshal Raha is scheduled to hold talks with senior military leadership and discuss a wide range of bilateral issues on enhancing defence cooperation between the two countries. While at Johannesburg, the Air Chief will also meet the High Commissioner of India Ms Ruchi Ghanashyam. The itinerary also includes a visit to Armscor, the Armament Corporation of South Africa and conducted tour of airbases as the ‘Fighter Centre of Excellence’ at Makhado and the South African Flight Test facilities at Overberg. In recent years, there have been close and frequent contacts at political and military levels between the two countries which are members of the tri-lateral initiative IBSA (India, Brazil and South Africa). Air Chief Marshal Arup Raha’s visit to South Africa would further boost bilateral relations between the two Air Forces and provide impetus to the ‘Make in India’ initiative.